Can I Move My Basement Column? And if so, what is involved?- Armchair Builder :: Blog :: Build, renovate, & repair your own home. Save money as an owner builder. Can I Move My Basement Column? If you are thinking of finishing your basement, you may have a desire to move a basement column that’s in the way. Maybe it’s encroaching on your pool table or in the middle of your future theater room. Can you move a basement column? Is there an easy way to tell if an existing column can be moved and if so, what is required to move it? Whether your basement columns and beams are made of steel or wood, they were designed to support the weight of the home above. These columns literally support tons of weight from above so you can’t just move move a basement column without some thought. Take a look at a four inch diameter steel column for example. At a height of eight feet, this column can typically support over 20,000 lbs. The taller the column, the weaker it becomes as it’s susceptible to buckling. The basic structural principle behind the beams and columns is this…the weight of the furniture and people rest on the floor joists. The weight from the floor joists are then transferred down to the basement beams and foundation walls. The beam is then supported by the foundation and the columns below. The columns rest on a concrete footing pad below the basement floor. This pad then transfers the weight down to the ground. Depending on your home’s design, there are probably other point loads coming down from the floor above. An example of a point load could be a column on the first floor carrying weight from a loft or hallway on the second floor. These point loads are sometimes picked up by several floor joists sandwiched together or possible by a laminated beam or two in the first floor framing. 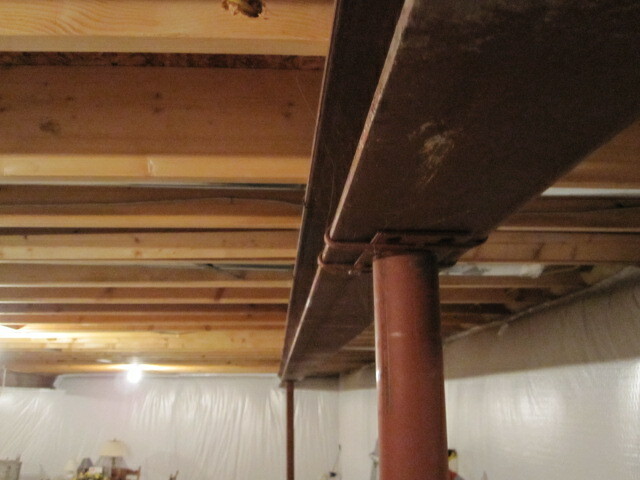 So, your basement beam was sized based on the combination of floor loads and point loads from above. Based on the material, weight and depth of your beam, columns are placed along it’s length to provide support. The heavier the beam, the greater the span can be between columns. In theory, the depth of the beam can also be increased to provide a stronger beam. However, most designers don’t consider this as it will decrease the headroom in a basement. When the engineering is reviewed to place the columns, they are typically spaced close to the maximum distance allowed. There are two reasons for this. First, each column and footing pad adds cost to the house. By eliminating a column, you can eliminate $100 or more from the cost of the house. The second reason basement columns are spread out as far as possible is to open up the basement to improve usability. The fewer the columns, the more space to do what you want. So in many cases, you can’t just move a basement column without adding two more columns or replacing the beam. Trust us, you don’t want to replace a basement beam unless you absolutely must. It requires shoring up the floor joists, removal of the old beam (which might require cutting it down for removal) and columns,…etc. However, if you only need to move a single basement column and don’t mind adding a couple in its place, you may be in luck. You will want to have an architect or structural engineer run the numbers to see what your options are. It’s typically possible to add two columns to replace one that is in the way keeping the overall unsupported length of the beam down as required. This may work in some circumstances…especially if the new columns can be hidden into the new framed walls of a finished basement design. In order to remove a basement column, the concrete floor needs to be removed at the column base…a twelve inch square should do it. Before removing the column the two new columns are installed. Your engineer will tell you how big the footing pads will need to be and this will dictate how big of a hole to cut through the basement floor. You will need to cut the floor, remove the stone and dirt from the new footing location, and pour the footing to the depth and size required. You will then need to wait a few days prior to installing the column to allow the concrete to gain strength. Then the new columns are installed and the old one is removed. Your last cost will be to pour the new concrete around the two new columns. So, what will this cost if you have a contractor move a basement column? As always, your particular circumstances can affect the cost greatly (i.e. local cost of living, availability of trades, basement access…etc.). However, we can tell based on experience that this project will cost you somewhere between one and two thousand dollars. It all comes down to how badly you want the beam moved. And of course, if you have the time to do the work yourself. You can sometimes move a basement column. Just make sure you follow the proper steps to do it the right way. And if you are still in the planning stages of building your home, talk to your architect about your options for column placement. Have you ever thought about building your own home? Be sure to stop by the Armchair Builder How to Build Your Own Home resource page.